It’s been almost a year since Windows Vista launched, and I think it’s about time to take a step back and look at its current situation. We have Vista Service Pack 1 on the horizon, and there’s been a sufficient amount of discussion around all of Vista’s quirks. Why do we need to come to terms with Vista at all? While it would be a thoroughly easy suggestion for us all to go back to Windows XP, that honestly isn’t practical advice for the majority of users out there. Those who’ve bought new computers since the beginning of the year have had it forced upon them, and others will soon be using it at school and work. No matter how you feel about Vista, it is an inevitable upgrade for Windows users. The new start menu is a vast improvement over Windows XP’s. 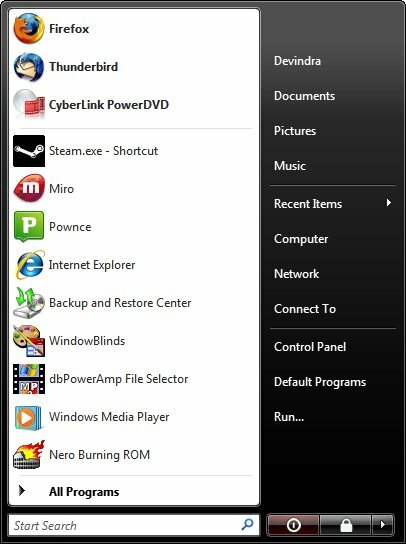 If you’re not using the Start menu search, then you’re missing out on one of Vista’s best features. The best way to invoke this is to simply hit the Windows key on your keyboard, and then immediately start typing. If you don’t have a Windows key, just click the Start menu and begin typing. By default it searches your personal files, internet history, and your All Programs folder. This can be tweaked to speed up search results by right-clicking on the Start menu, choosing Properties, and then clicking the Customize button under the Start Menu tab. In Windows past, configuring the operating system was to average users a skill akin to magic. The problem was multifold: options were generally confusing, overabundant, or both. It was the sort of unfriendly user experience that insured people like myself always had a paycheck. Vista makes significant strides towards remedying those esoteric options and making them clear to users from all skill levels. 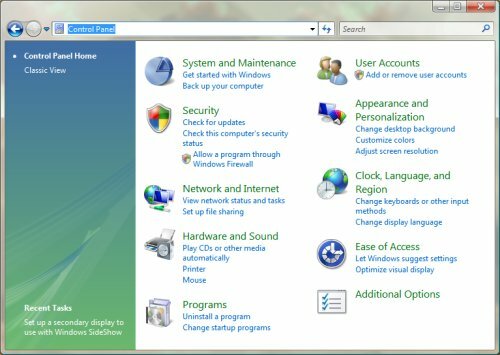 For example, when you visit the Control Panel in Vista, you’re greeted with a selection of nine functional categories. By digging deeper into them, you discover even more functionality that logically follows from the parent category. I should also mention that all of the categories in the Control Panel also feature descriptive shortcuts to commonly used functions. Techies may despise this as a “dumbing down” of Windows, but I honestly can’t deny the value this move has for typical Windows users. Those who prefer the old Control Panel format can simply choose the “Classic View” option to revel in its familiar anarchy. Vista is unequivocally a good looking operating system. While it may lack the polish of Mac OSX and some modern Linux distributions, it’s a vast improvement over Windows XP. Part of this definitely has to do with Vista’s new Aero interface, which takes advantage of 3D hardware in your system to render transparent Windows and other graphical niceties, but it certainly shouldn’t receive all the credit. After all, Aero’s main function, the pretty but useless Flip 3D feature, still pales in comparison to Expose in OSX. Rather, much of the joy in using Vista stems from seemingly minor additions. Everything from the new screen friendly system fonts, to the themes, color schemes, and icons, all work together to create the best Windows user experience yet. Even the included wallpapers show a commitment to a higher quality user experience by Microsoft. We all know Vista isn’t perfect, but hopefully as I’ve shown there are at least a few things to like about it. As with pretty much every Microsoft product, it will certainly get better over time. We have Service Pack 1 to look forward to early next year, and I anticipate that we’ll begin to see more significant upgrades throughout 2008. There are a slew of promised features that Microsoft had to drop from Vista to release on time, and as those get plugged back in I believe Vista will shape up significantly. Windows Update is now an actual application in Vista, rather than a website that you have to visit. In fact, if you try to visit WindowsUpdate.com in Vista, you get redirected to the application instead. I’ve found that because it’s an application, Vista’s Windows Update performs much faster than any previous version of Windows. I’ve also noticed that it does a much better job than XP ever did of finding drivers updated or missing drivers. Vista finally adds built-in functionality to monitor your system performance. The resource monitor allows you to track an obscene level of information on the CPU, memory, hard drive, and network performance of your system. While this functionality has existed in third party applications for some time, there’s always a benefit to having it built-in. It’s great for supporting other people’s computers, for example. Also, it’s one of the best examples in Vista that shows Microsoft isn’t necessarily “dumbing down” the OS. This program is a power user’s dream! I just posted an article about why I don’t hate Vista, but wasn’t as detailed. I was actually pretty surprised to find I like the new Windows. At first, it needed some getting used to, but once I figured everything out, I like it much better. There are some useless features, but my PC is only used for word processing these days.